MetalRockNews: Ghost's Nameless Ghoul: "Some people would like to know who we are"
Ghost's Nameless Ghoul: "Some people would like to know who we are"
One of Ghost's Nameless Ghouls was recently interviewed by Kaaos TV, below you can read some excerpts. 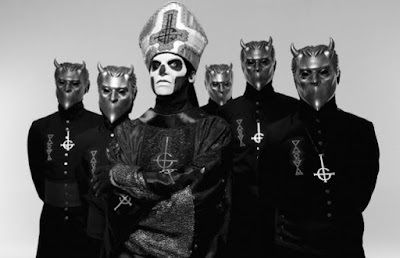 About if he thinks people like the fact that the members of Ghost have managed to keep their real identities secret by wearing masks and hooded cassocks in all public appearances, the nameless ghoul said: "I think that people like the mystery, but I also think that some people would like to know who we are, and some people do, but they don't talk about it, because maybe they wanna be in the secret little club that they're part of, once they know. I think it's both: some people don't wanna know, some people are dying to know… Not dying, but they're curious, at least."